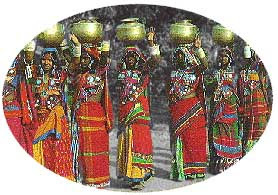 A scanning of tribes in India take us to Banjara tribes of Orissa. Such is the culture of these tribes, that the uniqueness and exquisiteness flows from top to bottom. 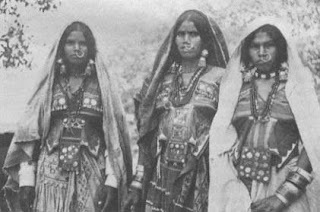 Though, their history is still a mystery, the dress sense, culture, customs and language, of Banjara tribe in Orissa signify that they originated from Rajasthan. Colorful is the one word that comes to mind when we think of this enthusiastic tribe of India. They live in settlements called Tandas. Urdu, Telegu, Kutni, Lambadi are amongst the popular languages spoken here. A woman of Banjara tribes in Orissa is accustomed to wearing "ghaghra" and `choli` (a blouse). Ghagra is a whirling skirt made of red, black and white cotton, with pieces of mirrored glass embroidered on it. The craze for Jewels is of the highest degree amongst these celebrated tribes of Orissa. 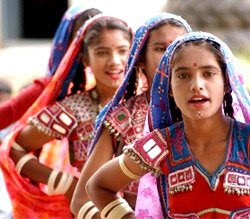 Anklets, silver earrings, hair plaits and bone bangles add charm to the enriched culture of Banjaras. Ugadi, is the most famous festivals celebrated by Banjara tribes of India. Festivals like Holi and Diwali are also indulged in with added interest. Banjara tribes in Orissa are huge devotees of Lord Venkateshwara of Tirupati. The love and dedication flourishes to such extent that, they save money from their living to visit to the pilgrimage of Tirupati Balaji. Marriage is something to look forward for in this vibrant tribe of Orissa. Enthusiastically celebrated, Liquor flows freely on the first day of the wedding when the bridegroom and his relatives are welcomed at the `tanda` of the bride. A royal welcome is given to the groom`s family by offering betel leaves and nut. On the day of Marriage, boy and girl exchange seven round balls made of rice, ghee and sugar. The couple then holds hands and does seven rounds of grain pounding with pestles. National and international demand of the aesthetic artwork of Banjara tribes of India is immense. Variety of materials like silver, brass, gold, cowries, ivory, animal bone and even plastic décor hold a high export demand. very interesting post and compilation of information. I am looking for Banjara Embroidery. Do you know of any SHG, Cooperative or NGO doing work with Banjara tribes from Orissa, Andhra or Tamil Nadu. very good and pleasing information on banjaras. it was really easy to find information on them.